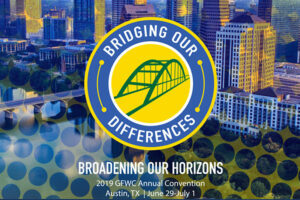 The clubwomen of the Texas Federation are hosting the 2019 GFWC Annual Convention and anxious to welcome you to the Lone Star State from June 29-July 1 at the JW Marriott Austin. Pre-Convention tours are planned for you to visit various sites in and around the city of Austin. Click here for more information on the tours. Convention will officially begin with the Opening State Flag Ceremony, followed by business sessions to act on proposed Resolutions and Bylaws. For celebration, there will be awards to honor your successes and accomplishments. There will be speakers, exhibits, vendors, partner networking, a service project, and raffles. View the agenda on the Convention registration website. Register now by going to the official GFWC Convention website. Click here. Being a first-time attendee of an event can be an overwhelming experience, but it doesn’t have to be! If you’re going to GFWC’s Annual Convention for the first time this year, use these tips to make the most of your convention experience! 1. First-Time Attendee Orientation: The orientation on June 28 from 4:45 p.m.-5:45 p.m. will put you at ease. From learning protocol tips to meeting other first-timers, it’s a great experience to kick off your first convention. 2. Lunch and Learns: There are two Lunch and Learns to choose from on June 29 from 12:45 p.m.-3:00 p.m. One is for Fundraising and the other is for GFWC Projects. It’s a chance for clubwomen to share their successful moments and inspire each other to adopt great ideas. Everyone is given a chance to speak, so come prepared with an idea to share. Bring pen and paper to jot down ideas from other clubs! 3. Tours: Every year the Convention tours are a big hit, and this year is no different! With options for a Texas History Tour, Day in Waco Tour, and Zip Lining Tour, take advantage of Austin adventures. It’s a perfect way to make new friends! Whether you’re a first-time or seasoned attendee, use our Convention Facebook frame on your profile photo to show your excitement and encourage your Federation sisters to join you in Austin. Register by April 15 to get the Early Bird rate!